Sackville Town Council has rejected a motion to delay accepting the gift of an armoured combat vehicle for installation in the town’s Memorial Park. During council’s meeting Monday night, Councillors Shawn Mesheau and Bruce Phinney moved and seconded a motion to postpone signing an agreement to accept the vehicle, known as a Cougar, until the council meeting in March. They argued that a postponement would allow time for consultation with the Sackville Legion. The 8th Canadian Hussars want to donate the retired Cougar to symbolize the regiment’s long association with the town, but Councillor Mesheau said that while he respects the Hussars’ connection to Sackville, he thought the Legion should have a chance to comment. However, other councillors voted against the motion to postpone accepting the gift after the town’s Chief Administrative Officer said CFB Gagetown, where the Cougar is being stored, is apparently anxious to move it within the next month or so. Phil Handrahan added that the Hussars had “a couple of communities” that were interested in receiving the Cougar, but preferred to donate it to Sackville. “I’m not saying it’s urgent, but I know that they’re basically anxious to have a decision so that they know it’s going to be moved off base,” Handrahan said. “I’d be very, very disappointed if this Cougar went somewhere else,” said Councillor Joyce O’Neil. “I can’t see any reason why the Legion would even really need to be asked about this, I guess in all fairness maybe they should, but I just don’t like to see us put it off so that there’s a chance that we would lose that,” O’Neil added. “I’m a little disappointed in the fact that we can’t give it another four weeks,” Councillor Mesheau said after the defeat of his motion to postpone accepting the Cougar. Mesheau also wondered just how urgent the matter really was. This entry was posted in Town of Sackville and tagged 8th Canadian Hussars, Cougar armoured vehicle. Bookmark the permalink. 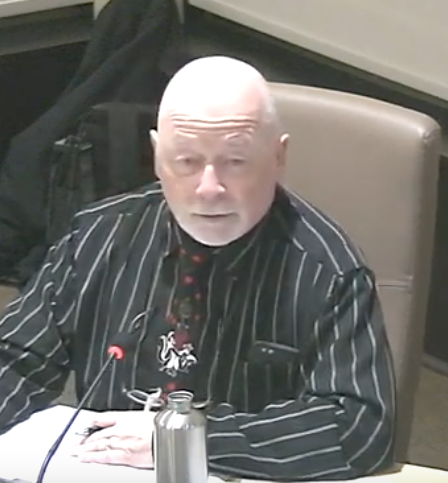 I certainly applaud the efforts of Councillors Mesheau and Phinney as they attempted to inject a degree of common sense into the seemingly hurried efforts to reach a snap decision on this matter. They had only 1 week to decide whether to accept this piece of Army Surplus equipment, which was taken out of service 13 years ago. Both Councillors Mesheau and Phinney recognized the propriety of consulting with the local Legion on this matter, since it is the Legion which is the ‘voice of the veterans’, and leads in our Remembrance Day Services each year, which culminate in the laying of wreaths at the foot of the Cenotaph. In addition to having a little extra time to at least ‘inform’ the Legion of this plan, postponing the vote until March would have allowed time for all those involved to consider all of the ramifications of accepting this gesture from the 8th Hussars. For one thing, what are the dimensions of the vehicle and how well would it fit into the Memorial Park? What sort of a base would it need to sit on and how much would it cost to construct it? When would it be delivered to Sackville? Where would it be housed until we are able to install it correctly at the Memorial Park? We already know it would require regular maintenance – in the form of a coat of paint ‘every few years’, but what about other issues with the condition of the vehicle? Are there sharp edges where people might accidentally brush against it and receive a cut? Would it be accessible for persons to enter it, with the possibility of becoming trapped inside? – Or injuring themselves as they enter and exit the vehicle? And who would be liable for any injuries sustained due to the presence or the condition of the vehicle? In looking around at similar memorials in many other locations around Canada and the World, one finds it is VERY rare to see any military memorabilia located in Cenotaph settings. Generally, there is the Cenotaph column itself, plus flower beds, often a walkway, and sometimes benches to sit and contemplate the casualties of war. Sackville’s Cenotaph is one of the very few which is beginning to take on more the appearance of an outdoor war museum, rather than just a memorial to the fallen. With this 11-ton new addition, the Cenotaph memorial itself runs the risk of becoming a ‘secondary’ fixture in the very park which was originally designed to honour it. 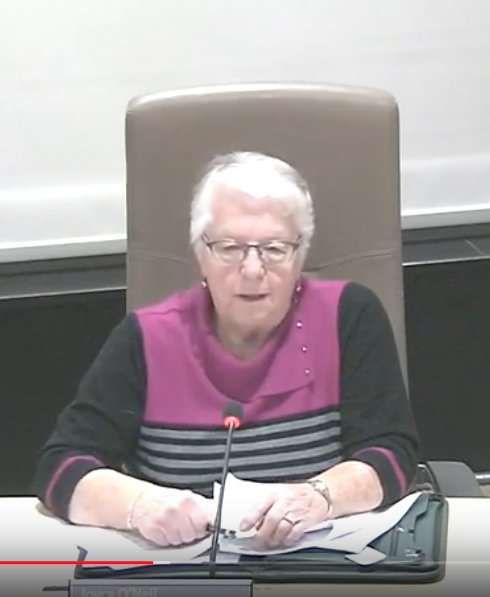 Councillor Mesheau said it well – so many decisions at Town Hall are being made in a rushed atmosphere, and they are generally based on only whatever information is presented to them by those wanting a positive result. We have heard this so many times over the past 3 years especially, since this current Council was elected in 2016. So many decisions have been “last-minute”, “rushed”, and seemingly “time-sensitive”, according to the way the issues are presented to Council by Staff, or Others as in this case. Council has so far, for the most part, in this particular administration, complied with whatever recommendations are presented to them, and delivered quick responses, nearly always passing whatever motion is before them. There is sometimes a ‘bit’ of discussion, with a minority of voices speaking in favour of doing more research or asking for more information, but at the end of the discussion the motions are nearly always passed. Perhaps it’s time for Council to take a step back and start examining every side of every issue, before making important decisions based solely on information provided to them from only one source. Well said. I couldn’t agree more. Why should our town be taking on the maintenance of such equipment, and at what point does the Cenotaph start looking like an odd assortment of war vehicles and lose its dignity? Councillor O’Neil says: “I can’t see any reason why the legion would even really need to be asked about this, I guess in all fairness maybe they should, but I just don’t like to see us put it off so that there’s a chance that we would lose that,” O’Neil added.” What, are you kidding!? The municipality has always deferred to the Legion on veteran’s issues and especially in connection to Memorial Park. Even outside the park, I was disappointed years ago when the local Legion branch said they had no concerns about the demolition of Mount Allison’s Memorial Library, which was built as a memorial to those who served and died in the Great War. Had the Legion opposed the demolition it would have been harder for Mount Allison to have gone through it. Beyond that Sharon asks some great questions; I bet most councillors would not know the answers. I think this will be a fantastic addition to downtown and thank the many veterans past and present for their service! If anyone is concerned with safety &/or any liability to the town, if the vehicle is obtained, it could be enclosed within an enclosure to prevent anyone from climbing on or entering the vehicle.